Hi friends, hope you are enjoying the summer! I’ve purposefully taken a break from blogging over the past few weeks to focus on home and family responsibilities. I also felt the need to grow and learn more for blog development. So many things to do sometimes. I just cannot do all things at all times, so I had to step away. It was needful. I am still working on learning new things and finding overall balance. I said ‘finding balance’ loosely because if you are a blogger and manage home, family, and maybe even an outside job, you already know things are not always smooth sailing. A few years ago, I could not understand why people said summer was so busy for them. After all, I was just always home with no kids in school. Now that our eldest is 6, has started school and the others are no longer tiny babies, we’ve been doing all kinds of outdoor activities. Plus we took a trip to Orlando which I have yet to post about. Hopefully, we can get back on a schedule soon. 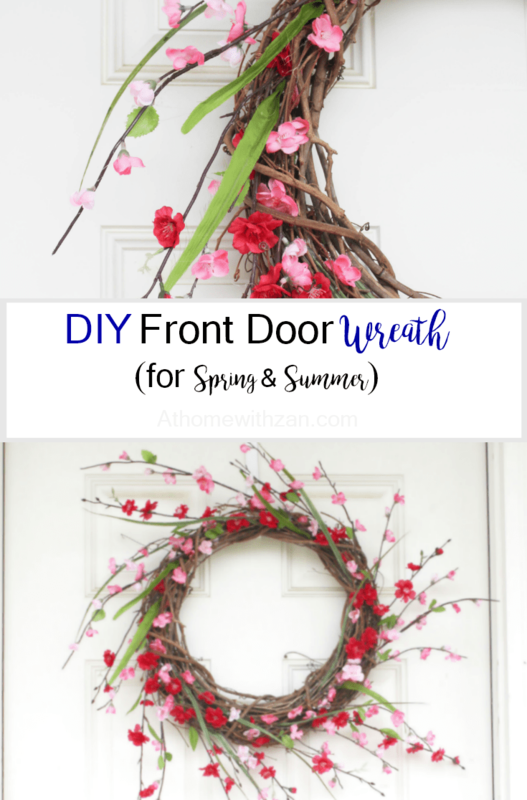 Even though I have not posted for a while, I have worked on some DIYs projects for the home (and room tours), some of which to post about, of course and including this easy DIY Front Door wreath. I’ve been wanting to create a wreath for our front door since Spring but so many areas in this house became a priority. 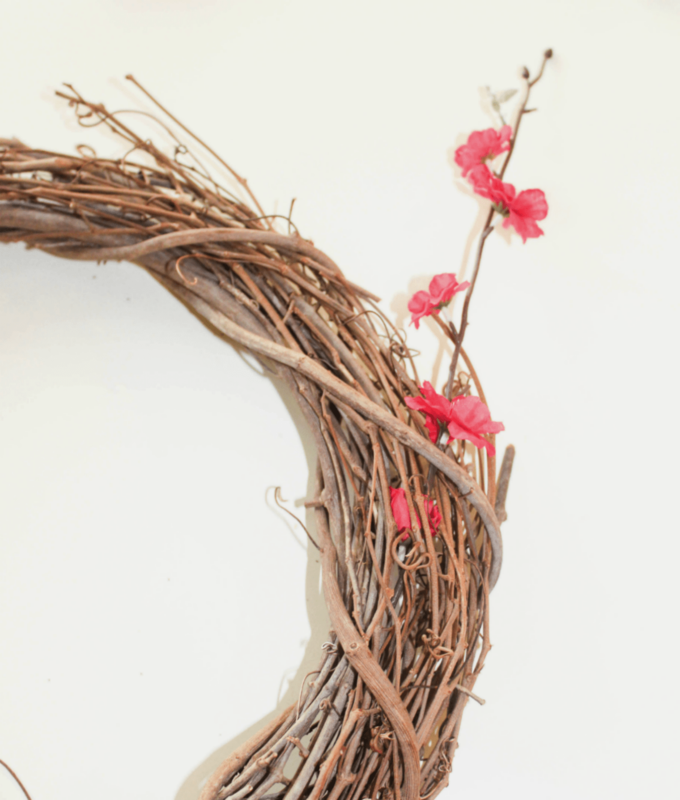 Instead, I used a simple grapevine wreath I had on hand to hang on the door. But it looked a bit borin and non-summer-y. While I was out shopping for some greenery to spruce it up a bit or maybe even buy one that looked great, I came across these pretty pink Apple Blossoms from At Home stores and thought they’d be great for summer. The wreath took about 10 minutes or less to make. Seriously! And we could not be happier with how it turned out. My husband was rather impressed! Every time I open the door or walk up to it, this wreath brings a smile to my face. 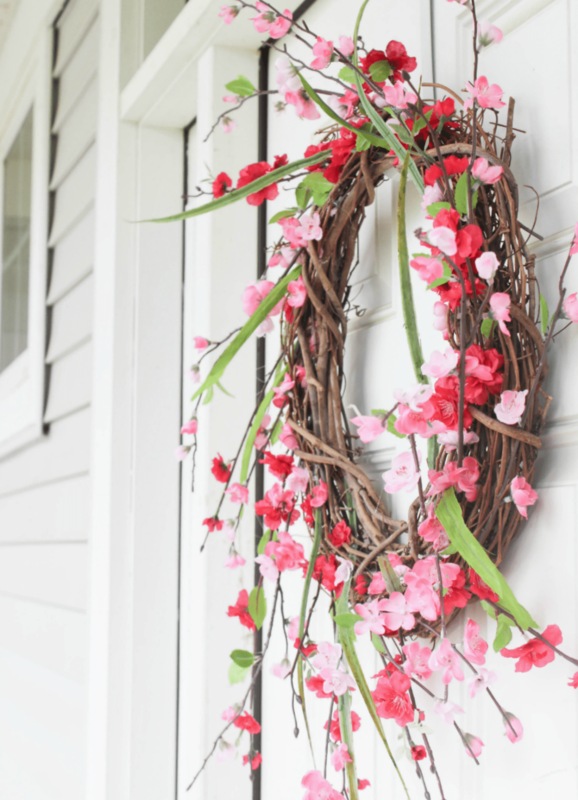 If you are looking for something easy for your front door for what is left of the summer, try this wreath – less than $10 and about 10 minutes. Or are you already looking into Fall? The stores are surely reminding us about it early. But I can’t help but let summer be summer. 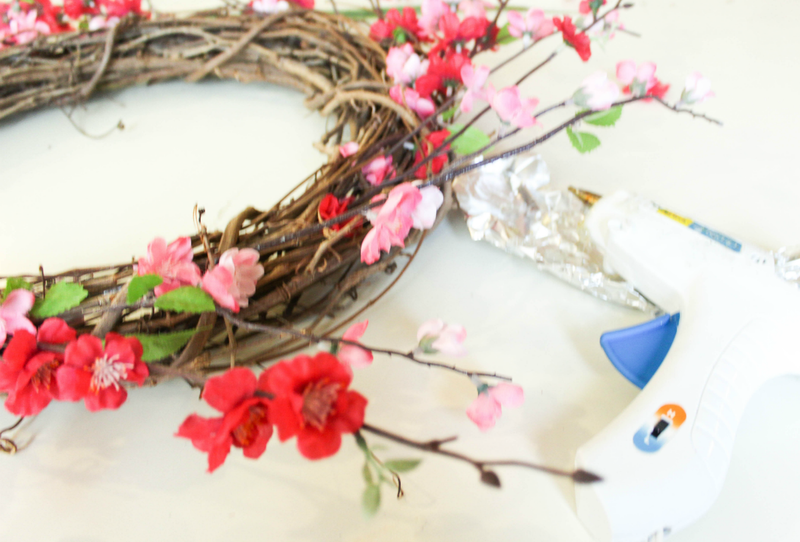 So while I may be late on the bandwagon with this DIY wreath, I still felt like sharing the tutorial. Hey, the colors are easy to switch off seasonally. So if you are thinking about Fall, just use Fall colors and you are going to be good to go!! Note: I made this quick wreath in the early evening when the sun was not so bright so you may see some slight darkness in the photos. Step 1: Use the wire cutter to separate each blossom branch, (if needed) and to cut each one to desired size. 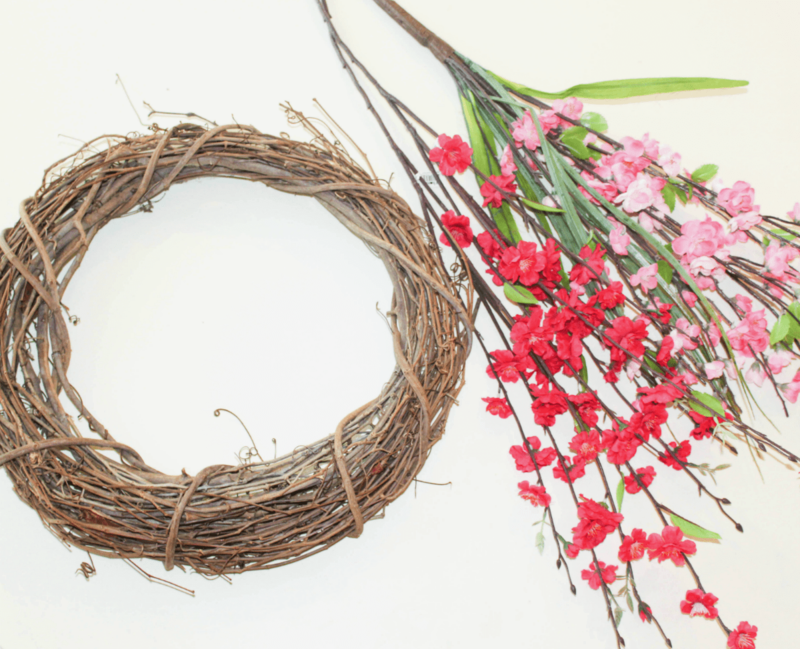 Step 2: Take each branch and push it into the grapevine wreath. Step 3: Secure branches with splotches of hot glue, if desired. I did this to ensure the flowers won’t fall off. All done! Hang up your pretty wreath on the door. 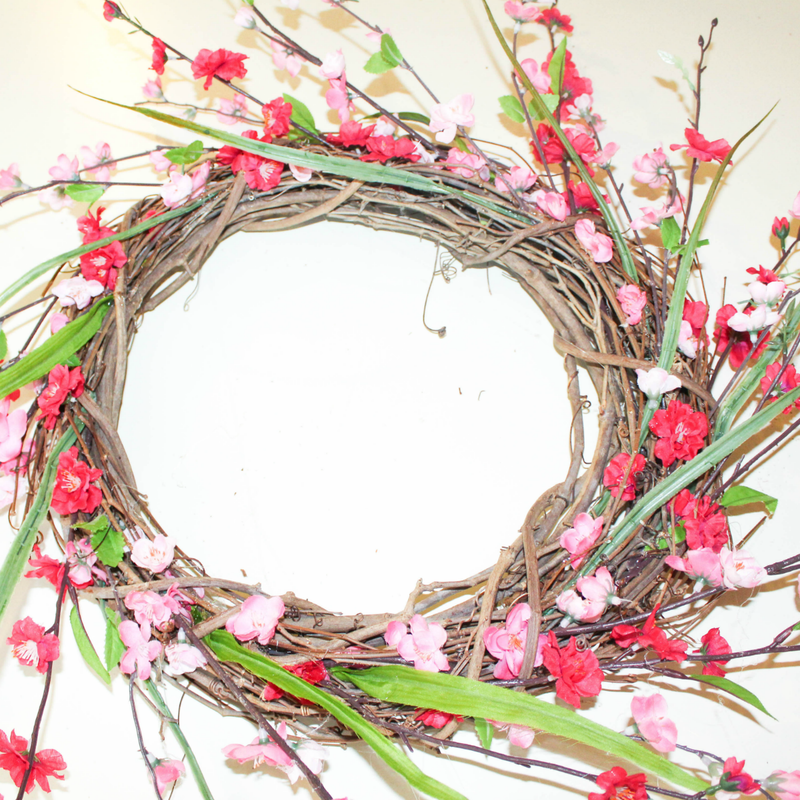 The loose blossoms are my favorite look on this wreath. Our front door looks so much prettier with the colors rather than with the grapevine wreath only. Once again, this wreath can be customized to match any season by using corresponding seasonal colors. Have you tried making your own front door wreaths? There are so many easy ways to make them and all you need is about 10 minutes or less once you find the right pieces. I’d love to know your thoughts in the comments! This is such a cute idea and you make it look so easy! Wow! This is beautiful! I love the rosy colors! Totally doable too! And so easy to make! I am kind of shocked myself of how easy it was to make! Thanks, Tiffany! I wish I was creative and talented to complete something like this! Somehow the art gene really skipped me (my mom was a hand painted artist) and I am not talented at all for DIY projects! This is so cute! this is a fabulous idea! I love how simple it is and it’s budget friendly so it ticks all of my boxes 🙂 great job! Thanks Claire! I love it too. It was so simple to make and the colors are just beautiful! I love wreaths like these! I see them at Marshall’s all the time but they are $30+! I jus think they look more interesting than traditional wreaths. I also love the colors you picked out! This is a beautiful list! Cant wait to try and make it! Thank you Jenn, Hope you like it! Love how simple and easy this is! I’m going to have to try to make one for my apartment door soon! If I do, I’ll try to remember to tag you in some pics on Instagram! Ahhh, thank you so much Kimberly. You should try it for real! And tagging will be awesome!! This is so, so darling! I love the colors in the wreath. Perfect! Thank you Summer! The colors are just so beautiful!